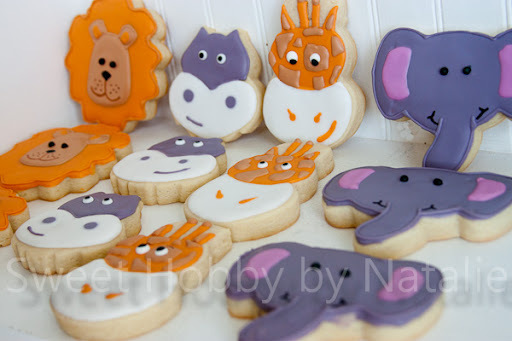 Sweet Shop Natalie: Lions, Hippos, Giraffes oh my! Lions, Hippos, Giraffes oh my! I forgot to post this picture of these Zoo animals cookies I did my cousin in Colorado. She was having a Zoo Animal themed party for her daughter and she asked me to make some for her. I think they turned out quite cute and I give credit to Sugarbelle on the Hippos and Giraffes as they are her design. I was so nervous to ship these but my cousin told me that they arrived safe and sound although they were a day later than the post office said they would get there! !